A junk car waits to be towed after an accident nearly two weeks ago. The stationary vehicle was among the issues discussed at the Port Jefferson Village Council meeting, and which will be addressed by the Port Jefferson Police Department as part of the village clean-up currently underway. PORT JEFFERSON — Port Jefferson Mayor Steve Butterfield and members of the village council determined the on-going problem with accumulations of trash, garbage, and junk cars has plagued the village long enough and will be dealt with accordingly. Lengthy discussions were held regarding a variety of lingering offenses, covered by past ordinances and resolutions, that have been duly noted and documented, but never fully enforced or resolved. Don Fair, village resident, started the discussions by asking what the mayor intended to do about overdue sewer bills and if there were plans to get things caught up, as the village could use the overdue payments for the good of the village. Butterfield’s response indicated this problem continues to exist because there is no easy way to rectify the situation. “Well, we can take them to small claims court, with the village paying all up-front costs to initiate the process, and the end result will probably be the addition of more overdue bills being added to the taxes of the property owners; then when tax time rolls around, the owners just pay on the taxes and not the overdue sewer bills and that’s as far as it goes,” he said. “We have at least two people who owe over $5,000 in back sewage bills and, coupled with back taxes, they’re over $10,000 in debt for those two things alone. Also, many of the homes in question are rental properties so the renters’ problem winds up in the lap of the homeowner who is then left to deal with the problem; many times in the past, when faced with having to play catch up on large bills, the renter simply moves away instead and the homeowners are stuck with paying the bill and just neglect to do so,” Butterfield said, noting there are also a few homeowners living in their own homes who have refused to pay, as well. Council member Tim Smith then noted that if nothing is done to fix the problem, the majority of village residents who do pay on time will continue to pay for those who do not, which is unfair. “We can’t just say, ‘Well, nothing has worked in the past, so we do nothing,’ as it encourages others to do the same and the problem grows; something has to be done,” Smith said. When asked if the sewer lines could be shut off, Butterfield noted there were no shut-off valves put in when the system was installed, so they would have to do that prior to any termination of services which, again, adds more cost to the village. After more drawn-out discussion, Butterfield referred the issue to the utilities committee, consisting of council members David Clem, Loretta Cook, and Sharon Whitehead, asking them for a report and recommendation at the next council meeting in March. Next came more extended discussion to determine where the mayor stood on getting the village cleaned up. In past meetings, council chairperson Tim Smith expressed his disappointment with progress on the village clean-up and pressed for enforcement of resolutions and ordinances approved by council in the past to remedy the problem. The subject was a major point of contention in the January council meeting, with conversations becoming heated when Butterfield was pressured about enforcement of existing ordinances designed to make improvements. After hearing from council about a variety of related examples about the lack of progress on the clean-up, Butterfield addressed those in attendance about the situation saying, “As of tonight, I am approving a list of summons to be issued by Police Chief Bell to several of the offenders who have received notifications in the past about their offenses and failed to come into compliance. Butterfield listed seven properties, of which the owners will receive summons. “These properties are in violation for offenses ranging from uncollected garbage and accumulation of trash to junk cars, and parked trailers full of trash, and also a couple of instances of the continual open burning of trash, which is prohibited within the village city limits,” he said. “We also have a junk car still sitting at one residence that has been an on-going problem for a long, long time, but we are not putting up with it anymore,” he continued, noting that particular violation will be referred to Shelby County Municipal court for review. “Any vehicles not licensed, or not being used, must be housed in a garage for storage, not left outside. Also, all licensed vehicles parked outside must be in good running condition, with the owners being able to verify that fact if asked to do so by the police,” Butterfield said. Council was in agreement with the proposed actions and Police Chief Bell noted he will be taking photos immediately to document the offenses in case there are questions later on about compliance. Butterfield also said the ticket amount for parking violations will be raised from $5 to $69 per violation, effective immediately. Butterfield noted cars are often parked the wrong way, by pulling in towards sidewalks, or parking against the direction of traffic flow, which is a hazard. In other business, Bell shared a proposed police budget for 2019, including provisions for police officer salaries, the purchase of a laptop computer for mayor’s court, and the annual payment for the LEDS (Law Enforcement Data Systems) used in the patrol car. Bell also announced the re-hiring of Austin Knight as a part-time police officer. Bell shared an overview of the projected costs, including approximately $12,000 for police officer salaries for the year, based on an estimated 70 hours worth of patrolling per month and implementation of the LEDS system in the patrol car consisting of $600 for the unit and $600 for connecting to the data base. Mayor Butterfield referred the budget to the finance committee (Tim Smith, Sharon Whitehead and David Clem) for consideration and asked that a summary of their findings be presented at the next meeting in March. Bell who is also the Street Superintendent requested the village truck be examined by a mechanic as the vehicle may need some repairs; council approved the request. In new business, Butterfield asked council about removing several of the old-style stop signs on the alleys and selling them for scrap, as the village is not required by law to replace or maintain them. Bell confirmed anyone using alley-ways are required to yield to traffic on city streets by law and technically the signs are not needed. Smith suggested the old signs be put up for sale on E-Bay, as they may be worth a substantial amount to those who collect old traffic signs. Butterfield said he would welcome any profit for the village from the sale of the signs and that council member Krystal Cox could post them on E-Bay, as suggested, along with the village lawn mower that is no longer used. Council member Loretta Cook asked about the condition of the police cruiser and if the necessary repairs were completed. 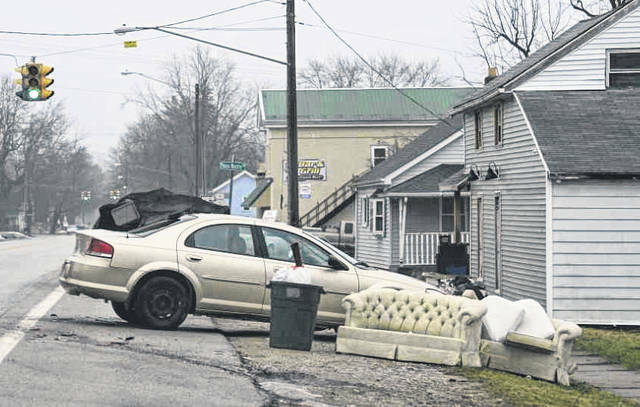 The next regularly scheduled meeting will be held at the Community Center on March, 4, at 7 p.m.
https://www.sidneydailynews.com/wp-content/uploads/sites/47/2019/02/web1_PJstory.jpgA junk car waits to be towed after an accident nearly two weeks ago. The stationary vehicle was among the issues discussed at the Port Jefferson Village Council meeting, and which will be addressed by the Port Jefferson Police Department as part of the village clean-up currently underway.